The Hammersmith Flyover has fully reopened to all traffic following five months of repairs. It closed completely just before Christmas due to problems with the cables which help to hold the concrete structure in place. Although it partially reopened a few weeks later lorries have not been able to use it until now. 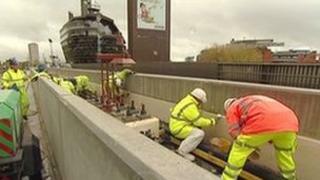 Transport for London says the repairs will mean the flyover can survive for several more decades. But Hammersmith and Fulham Council says it should be knocked down and replaced with a tunnel. The A4 route is used by about 90,000 vehicles a day. It was damaged by a steady seepage of salt water which weakened the 1960s-built structure. The strengthening works have seen about 200m (650ft) of the central reservation along the flyover removed and a new structural slab and concrete barriers installed. Tailored anchorages for the new cables were installed within the structure.